A picture is worth a thousand words. The first impression shoppers have of your brand is on a store shelf – make it a good one! An effective merchandising strategy can make it easier for shoppers to buy your products and add rocket fuel to your growth. To sell more and grow beyond other brands in your category, you need to use strategies that they overlook. This is going to be the focus of the solo podcast that you hear from me, over the next couple of months. I’ve had the privilege of working with and mentoring hundreds of brands and retailers in our industry. This series of podcasts are dedicated to answering some of the questions and addressing the challenges that they share with me. I surveyed the people who receive my weekly newsletter, and they’ve validated the same bottlenecks. The focus of this podcast is how to land shelf space and win at retail. This is the blueprint that you need to follow to ensure category growth and to get your products on more retailer shelves and into the hands of more shoppers. One of the biggest mistakes that brands make, literally all brands makes when they get into retail, is that they’re so excited to gain distribution with a new retailer, they don’t think about where their product belongs on the retailer’s shelf. This is a huge mistake, and as I said, literally every brand makes it. Retailers cannot begin to be an expert in every category and every item they sell. They need your help and they need your guidance. 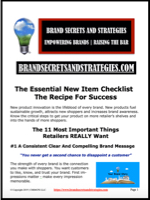 It’s to your advantage to help guide the retailer regarding where your product belongs on their shelf. A lot of brands don’t realize its schematic work is typically farmed out by the retailer to a third party vendor, typically a broker or someone else. They frequently decide where the products go on the shelf and how the category will be merchandised. Now while the retailer approves the schematic before they implement it, you need to know that your competition might be deciding where your product goes. The merchandising might also be decided by somebody who has no invested interest in the category. In either situation, you lose. Having someone that has no interest in the category or someone who doesn’t know who your customer is or how the customer shops a category, or even worse yet, having someone who has a bias, decide where your product goes. This can derail your brand and even seal your fate, dramatically limiting your ability to grow, to merchandise your product effectively or to maximize any promotions.